We have a range of services and products to help you design, print, present and finish your work to the highest standard. These services are available 24/7 in the Charles Seale-Hayne Library, with staff on hand to help and advise you. 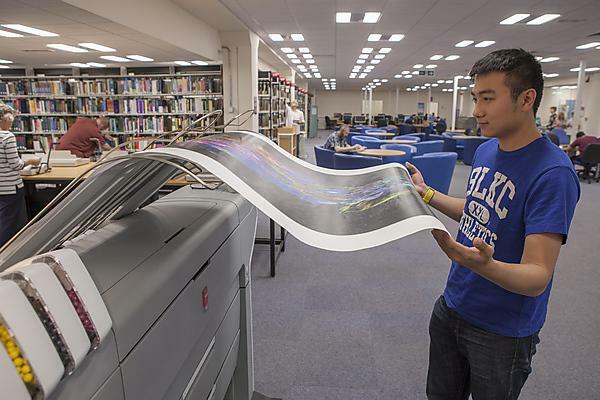 The library has a fleet of Ricoh digital black and white and colour multifunction devices to help you create everything from dissertations to business cards. Standard A4 and A3 size prints/copies. Enlarge or reduce your originals. Sorting and stapling finishing options. Print/copy onto card or acetate (sold at the information desk on level 1). Scan straight to USB stick - free of charge. Pay online with a debit or credit card. Follow the top-up webpage instructions; it’s quick and secure. Pay with a credit or debit card at the Library Information Desk, Plymouth campus. Swipe your University card at one of the money loaders and insert coins or notes. Use the equipment and products to bind your projects in a range of finishes. Buy the materials you need at the Information Desk on level 1 of the Charles Seale-Hayne Library. For facilities available in the Charles Seale-Hayne Library, please contact the library on LibraryandITenquiries@plymouth.ac.uk or +44 1752 588588.